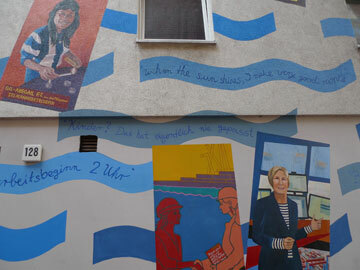 "Women working in the fish industry, 1994"
"Women harvesting coffee, tabaco, and bananas"
"Wipe and swish  the cleaning ladies"
"The strike of the coffee bean sorters"
"Girls in view - their future in the harbour"
"Women at sea  past and present"
"The Elbe and the 'work' waves"
"For the women from the Dessauer Ufer"
"Working Women in the Harbours of New York City and Hamburg - a Bridging Project"
Große Elbstraße 132: the walls of the Seamen's Mission and the building housing the Haifischbar (Shark Bar) located at the Altona Fishmarket / Timber Port. 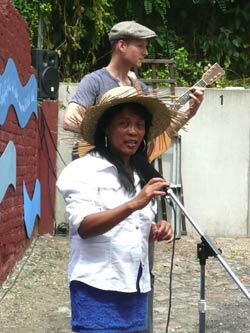 snapshots from the spring of 2013. 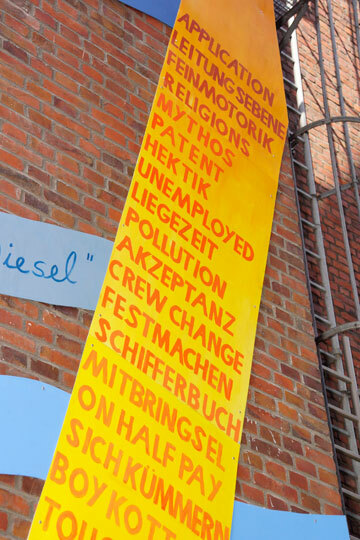 It was created in July 2013, at the Timber Port: “Working Women in the Harbours of New York City and Hamburg – a Bridging Project” is the title of the bi-cultural project located at the northern shore of the Elbe River. 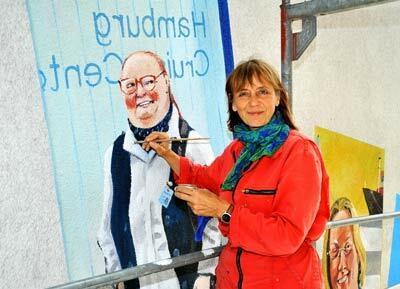 The Hamburg Culture Senator Barbara Kisseler is our patron. 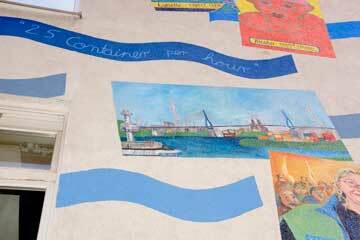 It took the good part of half a year for Hildegund Schuster and Elisabeth von Dücker, directors of the only nationwide open air gallery for women's harbour work, to prepare the mural. 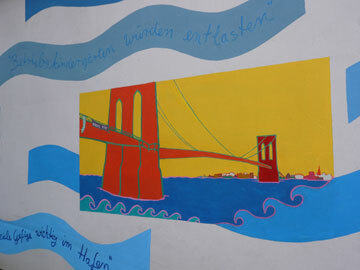 The concept of building a bridge between the harbours of New York City and Hamburg involved winning the collaboration of the New York artist Janet Braun-Reinitz, making interviews in various harbour firms, searching and finding a wall at a perfect location, and winning over sponsors for our idea. 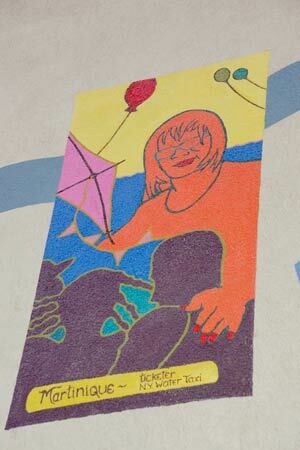 The painting was conceived through an artistic-documentary cooperation. 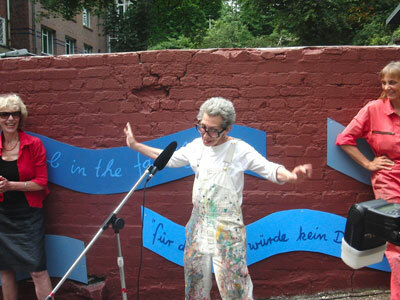 The principles are two artists and an art historian: the internationally active painter and civil rights activist Janet Braun-Reinitz from New York, the Hamburg artist and freelance employee at the Hamburg Art Museum Hildegund Schuster as well as the art historian and curator of the Open Air Gallery Dr. Elisabeth von Dücker. 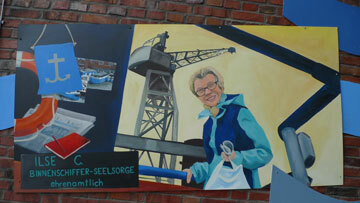 Dr. von Dücker developed the Bridging-Concept and carried out research in the Hamburg Harbour. 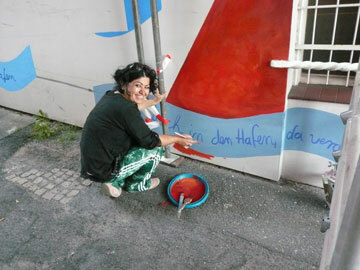 Artistic assistance was provided by the Hamburg painter Ayse Kazci. 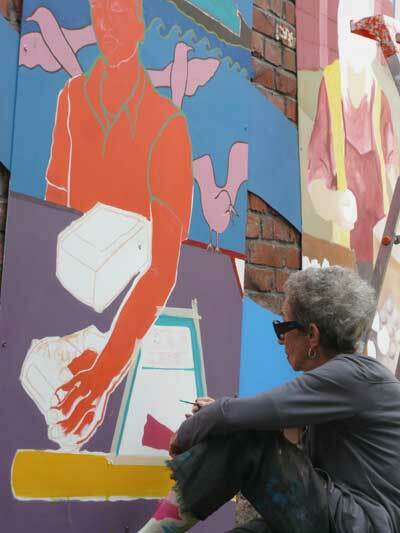 The art project brings into view what is going on and changing in the work at the harbour – for the most part not publicly accessible. 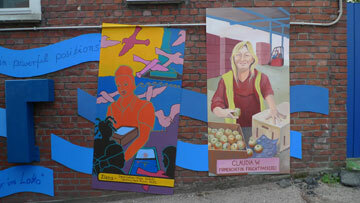 Harbours can't operate without a female labour force. 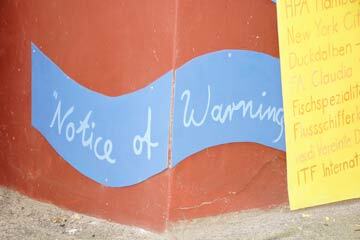 Is the myth, that harbours are primarily male domains, gradually fading? 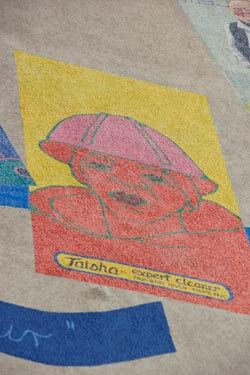 Only hesitantly, taking a closer look, we find “glass ceilings” everywhere – a metaphor referring to the difficult access for women to higher positions. In reality, the traditional gender specific high-low job hierarchy is mostly dominant. Nevertheless, things are stirring in the Hamburg Harbour. At the beginning of the 21st century some previously male jobs opened up for women: jobs in harbour and inland shipping, logistics, van carrier and crane operation, engineering in leading positions in state-owned or private logistics firms, dockyards, and harbour railways. 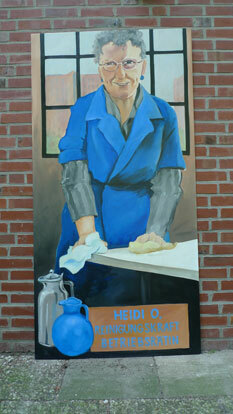 Jobs in the works councils and unions also came into female hands. 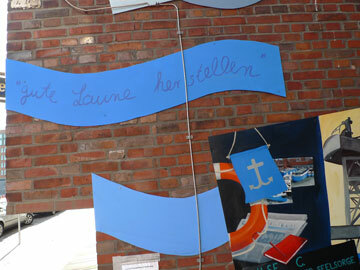 Female captains, supervisors, and commissioners are also active in New York's harbours. In parallel, there exist low paid and precarious jobs, and jobs for persons without papers which were always typical women's jobs such as cleaning, cooking and care work. 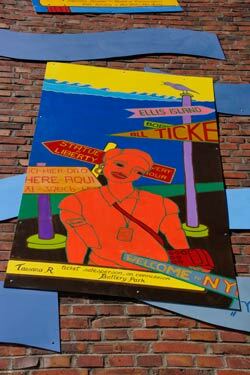 Doing research for the mural was like discovering new territory in one's own city, researching a wide spectrum of documentation and impression. 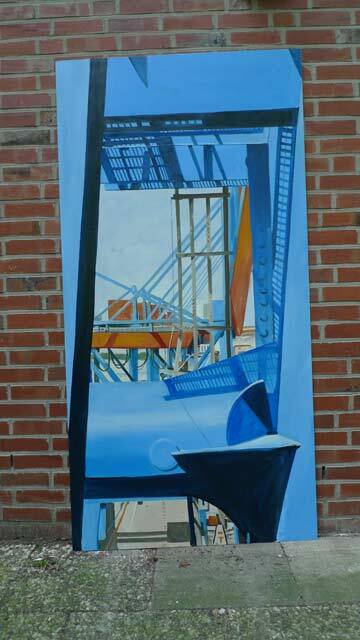 Janet Braun-Reinitz did her research in the harbours of New York. 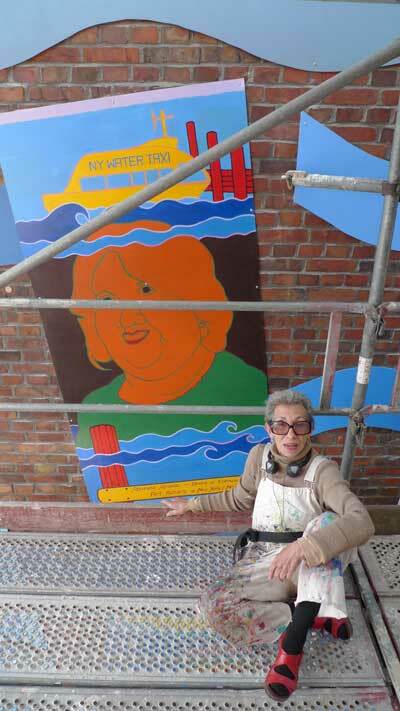 She realized ten portraits for the Hamburger Project: cleaning women partly employed and desiring anonymity, the tugboat captain Pamela, ship's hostess Sandra, ticket sellers working in harbour tourism, and Rossana Rosada, an icon of female occupational success. The Latino-American Rossana Rosada is to date the only female member of the executive committee of New York's harbour administration PANYNJ, the Port Authority of New York City and New Jersey. She is also the publisher of EL DIARIO, the oldest daily Spanish language newspaper in the USA. 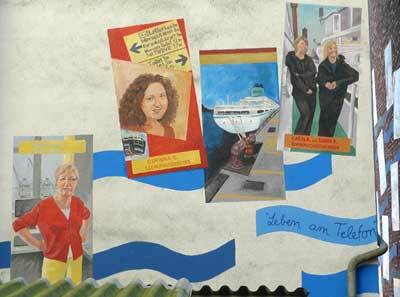 Elisabeth von Dücker did research in the Hamburg Harbour for several months resulting in twenty five interviews and photo-series. 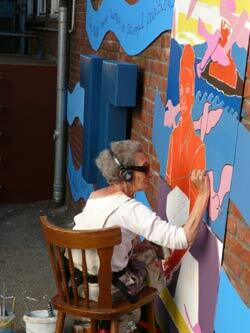 On the basis of this research, the mural painter Hildegund Schuster developed a portrait gallery. 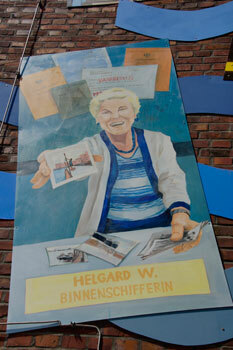 She depicted typical harbour occupations where women were traditionally or only in recent years allowed to work, be it in the harbour medical service, in Hamburg's leading logistics firms HHLA and Eurogate, in the harbour's foodstuffs branches, or in the seamen's club Duckdalben. The research also involved locating adequate walls. 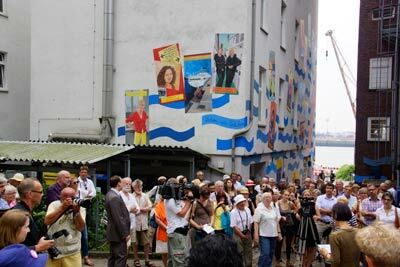 After several months, a beautiful location for the mural was found in Altona (at the former Timber Harbour) in the narrow Baumannstreppe passage between the listed historic German Seamen's Mission (east wall) and the building housing the well-known and beloved Haifischbar (west wall) at the addresses Große Elbstraße 132 and 128 respectively. 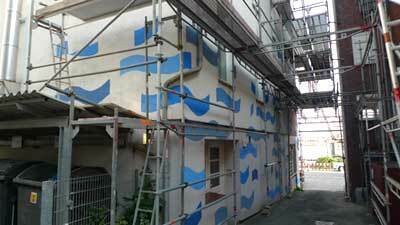 The complete New York-Hamburg work with a total area of 300 m² can be seen on the walls standing in oppositions. Harbour of New York City. 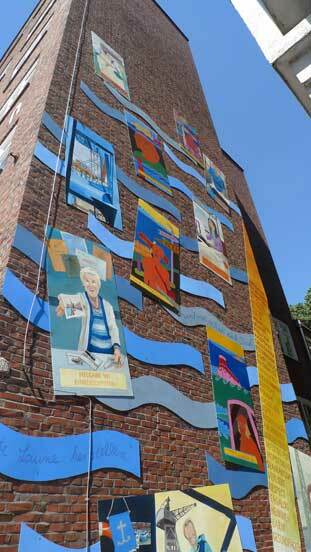 35 panels of 1 x 2 m size show six harbour scenes in New York and Hamburg. 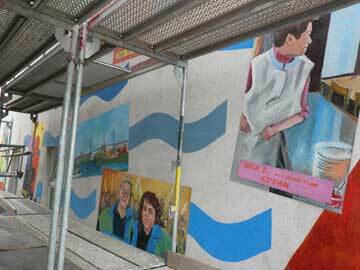 For example, there is a view of the Brooklyn Bridge with flapping “Oupy” and “Equal Pay” banners. 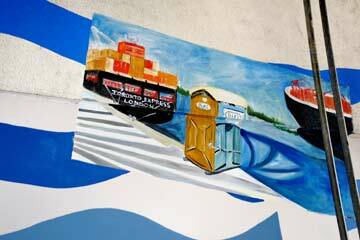 Or a Hamburger Harbour scene with a toilet facility on the quay close to the familiar container ship – not a motif of the usual sort, but one that brings the view of harbour work in perspective. 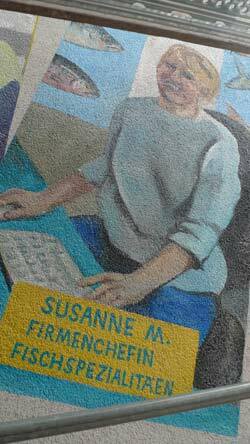 There are also the 29 portrait panels. 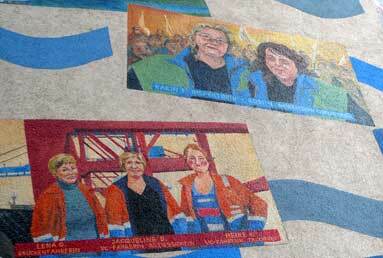 They represent snapshots of female economic power. 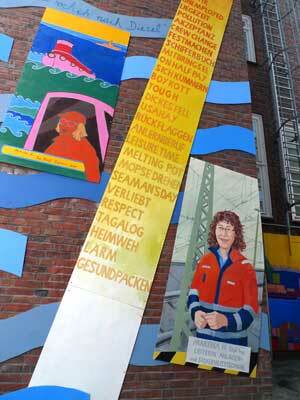 The 34 harbour women are presented with their first names and their occupations. 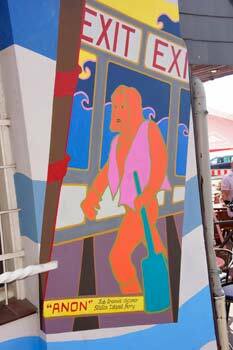 The locations where they work are painted on a yellow panel to the left. 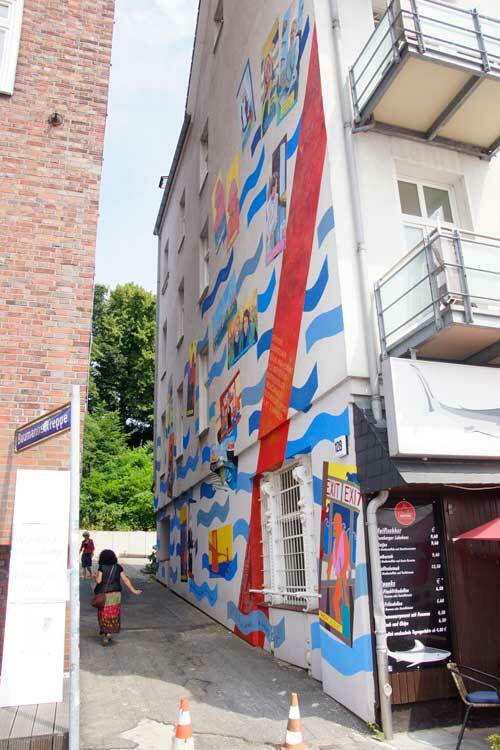 West wall of the building housing the Haifischbar. The compositional lay-out of this public portrait gallery may at first glance remind one of motif cards loosely spread over a large area. Not oriented at right angles, they also seem to be in motion as are the undulating waves surrounding them. 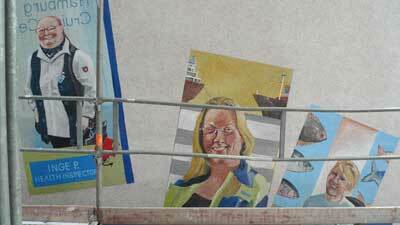 Dancing portraits counteract the conventional lay-out of images, distorting the perception of earlier clearly defined conditions in the world of harbour work. Wave “I'm the boss here“. 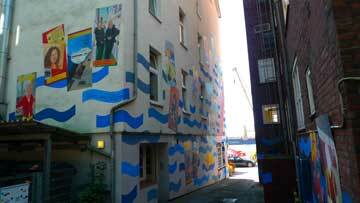 Due to the by-laws on the preservation of historic buildings, the artists were not allowed to paint directly on the wall of the Seamen's Mission, but had to paint on Neobond plates, which put a definite strain on the limited budget of the Project. 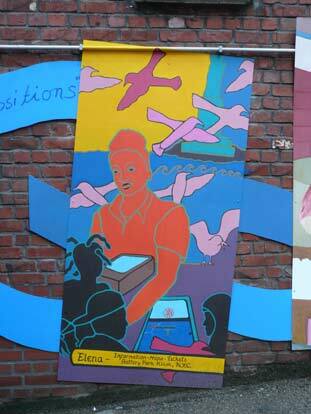 Portrait “Elena - Information - Maps - Tickets. 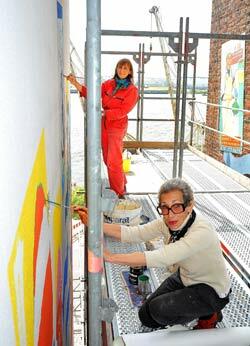 In the creative conception of the mural, two “grandes dames” coming from different wall mural movements met: Janet Braun-Reinitz, inspired by the mexican Muralismo-Movement in the early decades of the 20th century, paints large striking forms with fervent colours; Hildegund Schuster, inspired by European realism of the 20th century, paints in a rich in nuances style but with a cooler “palette”. 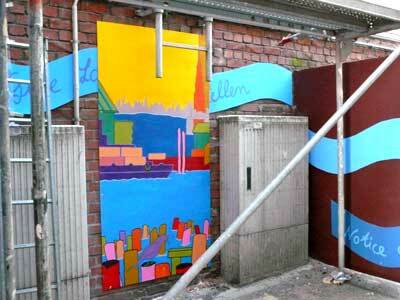 Two different personal styles in a joint mural work – a mix of styles mirroring the many shades and colours of harbour life here and there, creating excitement and maybe curiosity, scrutinizing the pictures of an open-air show and searching for their message. 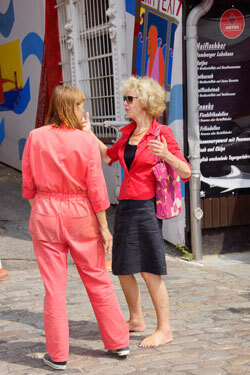 The directors of the Open-Air Gallery are very pleased about the successful cooperation with Janet Braun-Reinitz. 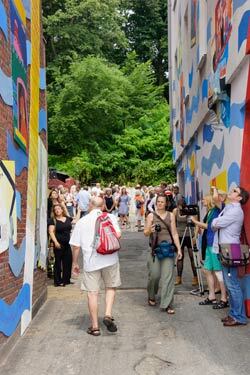 (1) She is one of the outstanding artists of the North American mural movement and is president of ARTMAKERS Inc. 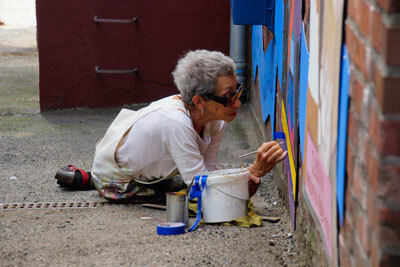 Her more than fifty paintings in public spaces, “community murals”, may be seen in New York and world-wide. 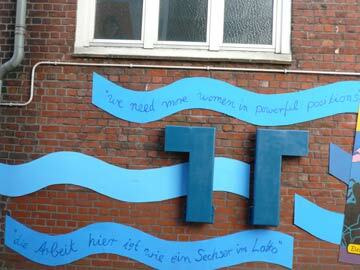 Her credo: socially critical, participative, gender democratic. 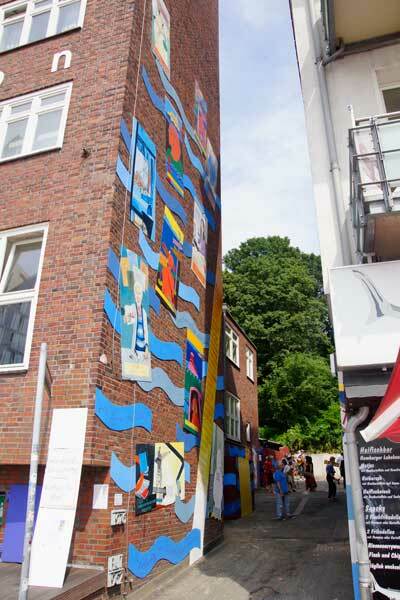 Thus there is a connection with the work and philosophy of the FrauenFreiluftGalerie Hamburg, active since 1994. 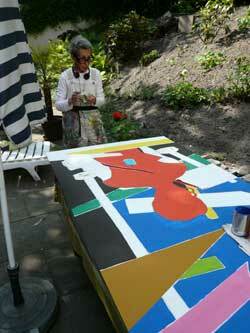 During a conversation while painting here in Hamburg she said “yes, those murals are political, that´s why I am here”. 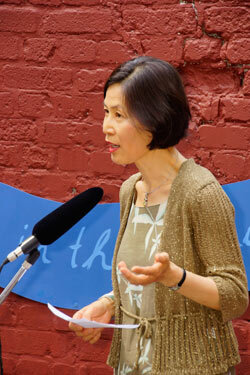 The new women's movement is active in integrating women's history into general history. 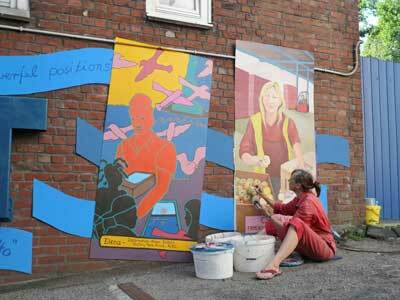 Here she is being “painted” into the city history with a global reference and completely without heroins. Perhaps a picture encouraging courage? 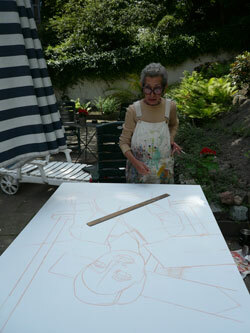 (1) The contact to her resulted from a recommendation by the in Hamburg living artist JOKINEN. Many thanks! 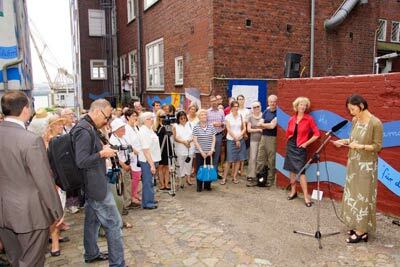 We would like to gratefully thank our project sponsors: Hamburg Ministry of Culture and Media, Altona Borough Council, Hamburg Foundation in Support of Science and Culture, the American Consulate Hamburg, SAGA, ITF International Transport Workers’ Federation, German Seamen's Mission Hamburg-Altona, Aurubis AG, and HHLA. 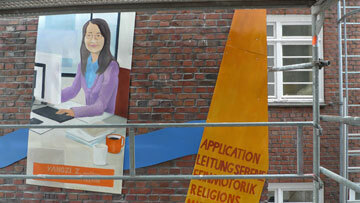 Thanks to: Gil-Abegail Fortich-Taeubner for her Philippinian song “Usahay”, Katharina Moll, student trainee for painting, and to Annika Meier, both painters of the “Mädchenwandbild” from 2012. 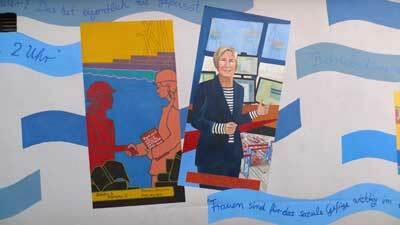 I am very pleased to be present today at the opening of the FrauenFreiluftGalerie Hamburg. This notable event connects many interesting elements, that are important from a intellectual-cultural perspective, but also important for me personally, being a women. 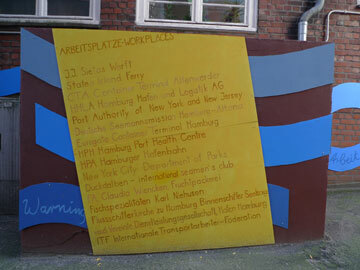 This great project brings Hamburg and New York closer - two wonderful cities that have much in common. For instance, they both developed on the basis of their harbours and trade, and today belong to the liveliest cities of the world. 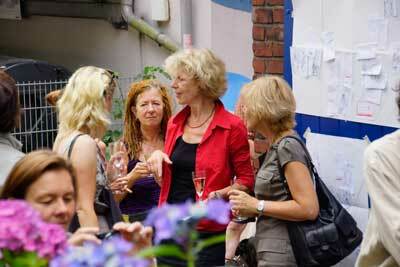 They are both cultural capitals in which one may enjoy numerous exciting events. 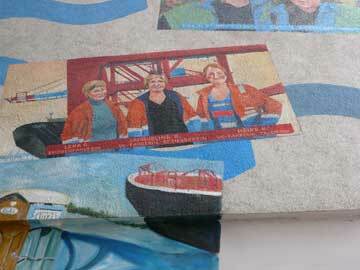 This project uplifts the role of women in art as well as in the harbour and in trade. We can all agree that the horizon for women is constantly expanding and that women today have more possibilities than ever before. Be it in sports, business or politics, women play a steadily growing role in contributing ideas, imagination, and achievements. 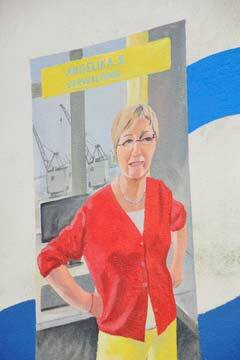 The female economic power in the harbours is no exception. 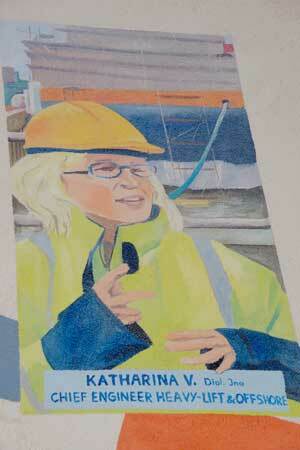 Women have and had many and diverse careers in the harbour – from fish filleters or office employees, to metal workers or engineers. 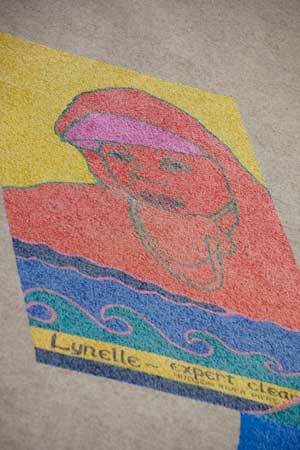 Women were often captains of their own ships. 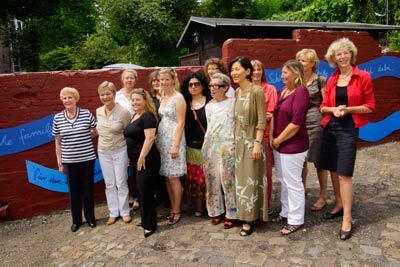 Without the material contributions from women in the harbours, Hamburg – and its famous harbour – would not be so successful as it is today. 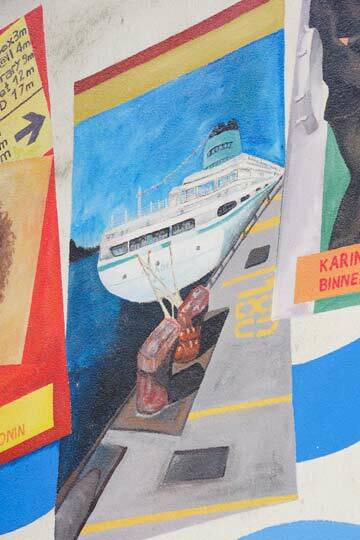 We now see murals in the harbour that take up and honour the pioneer work of the ”harbour women”, wonderfully painted by Ms. Braun-Reinitz, Ms. Schuster, Ms. Kazci and other very talented artists. 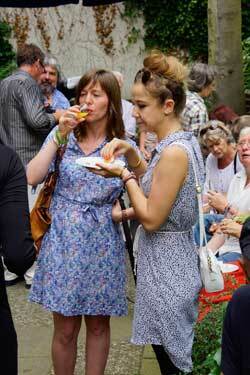 We were of course very pleased to support such an event. 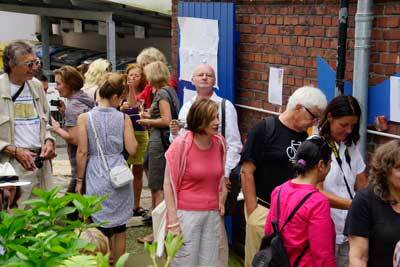 I would like to once again thank the FrauenFreiluftGalerie and congratulate all artists for this opening. Thank you very much. 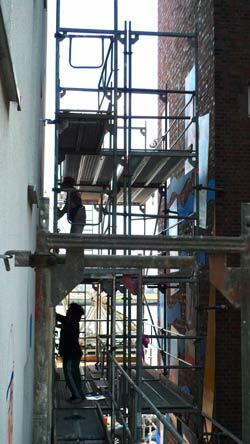 Scaffolding as seen from the Große Elbstraße, view of Baumanns Treppe. 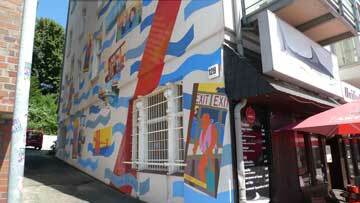 East wall of the mural at the Seamen’s Mission. 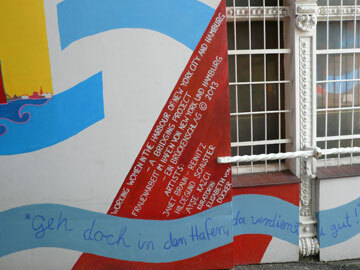 Back of the mural at the house with the Haifischbar. West wall at the house of the Haifischbar, detail at a height of approx. 7m. 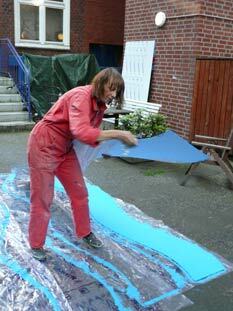 Artist Hildegund Schuster prepares the waves. "Work begins at 2 am". School girl Alaida Hobbing painting word strips. 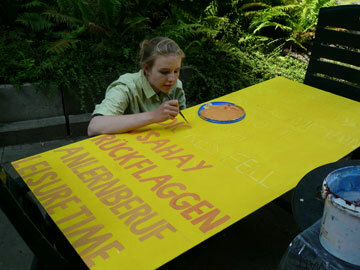 School girl Katharina Moll working on the word strips. 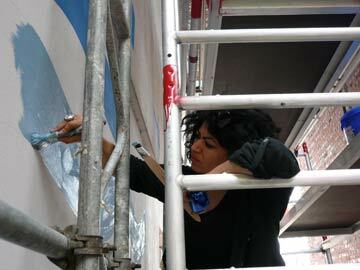 "Try the port, the wages are good"
Artist Ayse Kaczi at work. Köhlbrandbrücke bridge, port of Hamburg. HHLA gantry crane, port of Hamburg. 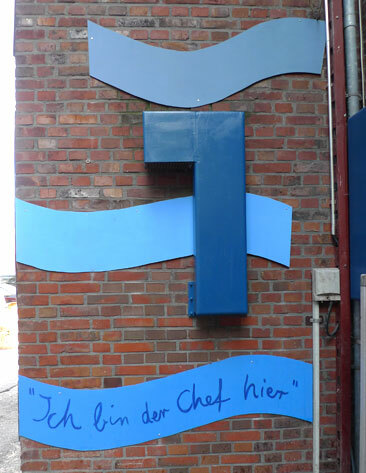 HHLA quay wall, port of Hamburg. 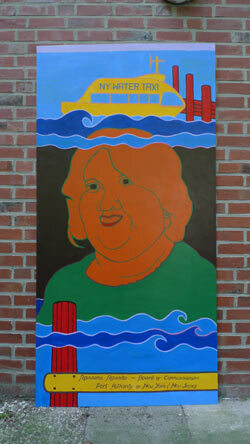 Portrait "Corinna D., seamen’s deacon“. 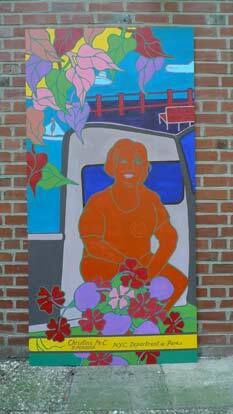 Portrait "Christine Mc C., supervisor, N.Y.C Department of Parks". 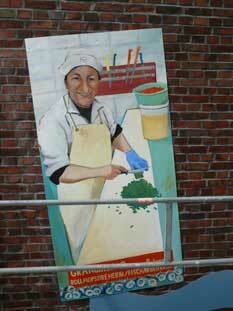 Portrait, "Claudia W. boss of fruit packing firm". 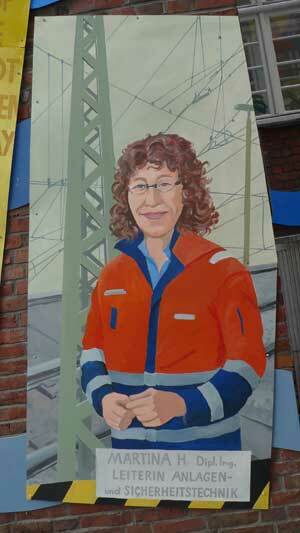 Portrait "Elena G. gantry crane operator. Jacqueline B. VC operator, worker’s rep.
Heike R., VC operator, tallywoman"
Portrait "Gerlinde J., engineer, head of department". 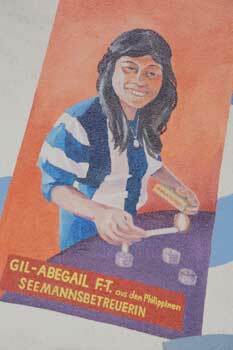 Portrait "Gil-Abegail F.-T. from the Philippines. 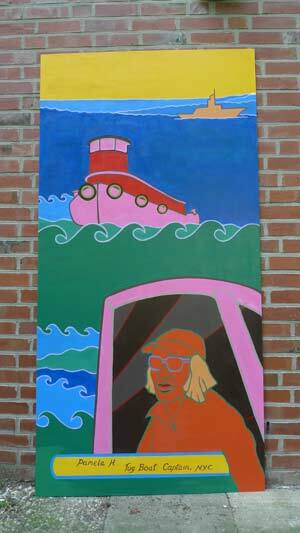 Seamen’s counsellor". Portrait "Gracinda G. de S. from Portugal. 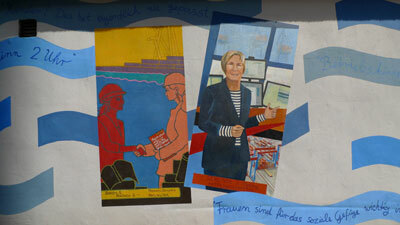 Fish worker (rolls rollmops)"
Portrait "Heidi O., cleaner, worker’s rep."
Portrait "Helgard W., barge crew". 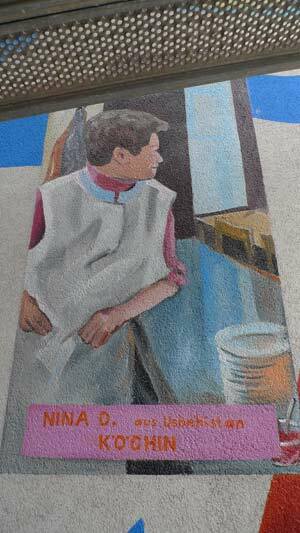 Portrait "Ilse C., inland navigation pastoral worker, volunteer". 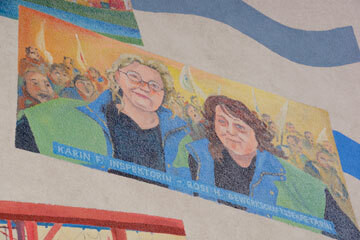 Portrait "Karin F., inspector Rosi H., union secretary". 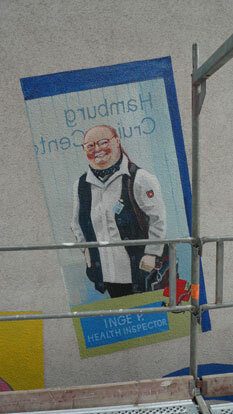 Portrait "Inge P., health inspector". 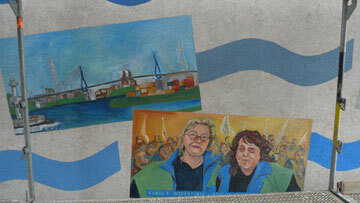 Portraits "Karin R., Sigrid R., barge crew". Portrait "Martina H. engineer, head of machinery and safety systems". 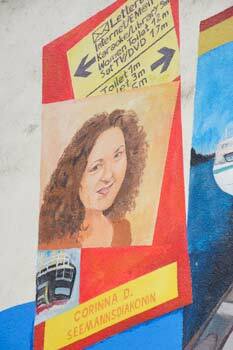 Portrait "Kerstin B., ship cashier, shop steward". Portrait "Nina D. from Uzbekistan. Cook"
Port Authority of New York / New Jersey". 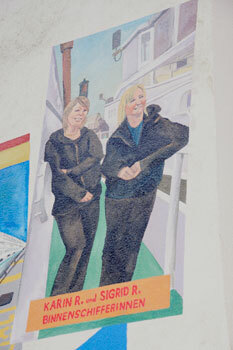 Portrait "Sandra S. and Rochelle S., planners / designers. 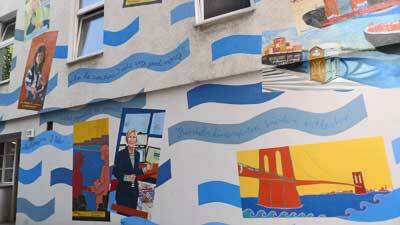 Port New York". boss of fish speciality firm". Portrait "Yangzi Z. from China, computer specialist". 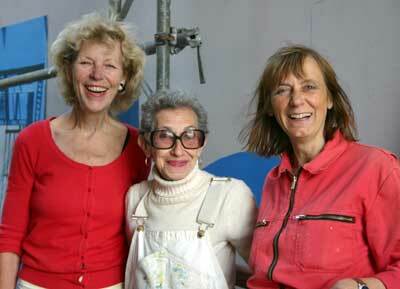 Artists Hildegund Schuster (left) and Janet-Braun-Reinitz (middle), curator Elisabeth von Dücker (right). 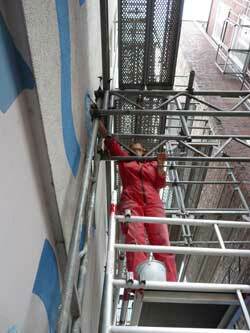 Hildegund Schuster on the scaffolding. final touches before the inauguration. 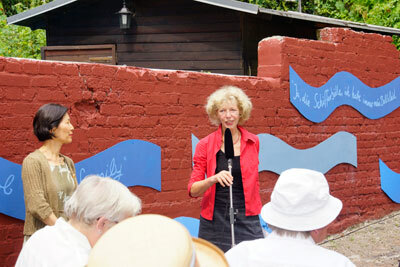 Speech by the curator Elisabeth von Dücker. 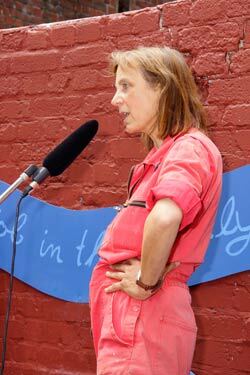 Speech by the artist Janet Braun-Reinitz. 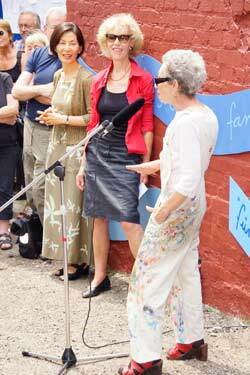 Speech by the artist Hildegund Schuster. Group picture with port women featured in the portraits.